I believe that a key question that has not been addressed, but is central to the controversy, is: how to use the Web as a teaching platform appropriately? A Web site does not foster the same type of discussion and interaction as a classroom. In fact, most of us tend to read a Web site article quickly, cursorily, and often partially. Thus sensitive topics presented on the Web can potentially cause more controversy. I have read the original spotlight article on the MIT Web site. Professor Dower did comment on the atrocious nature of the images, and the offensive materials were only direct translations from the wood prints. Unfortunately the professor’s own comments did not come until the last paragraph of a long article, and the offensive materials were often not quoted or explained. While I have no doubt of the professor’s purely academic intent, I believe that how to present the material appropriately and sensitively on the Web is something the professor and the MIT community should examine. This is crucial to the success of OpenCourseWare as a viable teaching platform. I am disappointed by the way Friday’s news article “Controversy Over Image Leads To Removal of OCW Class Site” on “Visualizing Cultures” was composed. There are no quotes of opinions from the Chinese students at the forum, particularly, the conversation I had with the author. I have to admit that there are people who reacted irrationally to this incident, but one has to understand that on one side of the debate, there are two MIT professors who can be easily coordinated and organized, while on the other side, there is a large and international disturbed community. While the majority of this community is rational, it is not surprising for a few members to overreact. The Tech article highlighted extreme behavior while ignoring the behavior of the majority. I spent a fair amount of time explaining that this event is not about racism. I clearly stated that it is not Professors Miyagawa’s Japanese origin that led to the flooding of protest e-mails — rather, it was the misleading materials on OCW. The author also failed to point out that Professor Miyagawa is the only contact person listed on the Web site. The second point I elaborated in our conversation is exactly “censorship” vs. “sensitivity.” We strongly support free speech and academic freedom, but feel that proper context is required. Clearly, there are some sentences on the Web site stating that the art work is propaganda, but apparently, the majority of the readers fail to get the message. That is why I requested that Professors Miyagawa and Dower explicitly point out that the following artwork is taken from propaganda in domestic Japan and is biased. If such a message is successfully delivered, I am sure nobody will question these statements. When the majority misinterprets intention, proper and explicit narration from the author is required. Although I regret the way The Tech reported this incident, I respect its right to choose what facts to print. However, it is dangerous to selectively publish truth. 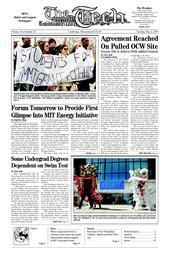 The statements released by MIT and its faculty revolved around their relationship with the Chinese community, and did not address the general audience that reads MIT’s homepage and the Institute’s social responsibility as reputable educators. As the world’s leading educational entity, MIT shoulders great social responsibility not only to its student body but to learners worldwide, and its homepage is a gateway to the world of science, technology, and more importantly, pursuit of truth regarding society and humanity. If the materials in discussion can lead to such divergent interpretations among well-educated students and scholars, I cannot imagine what possible confusion and disturbance the Web site may cause its highly impressionable audience — youngsters and adults with little knowledge about this part of history. For this reason, I find it shocking and inappropriate that MIT, though with good intentions, publicized these materials without providing proper additional guidance and historical contexts. Former students of “Visualizing Culture” explained that the professors’ lectures helped them to decipher the images and the history of the war. What happens to audiences who never set foot in the professors’ classroom? Shouldn’t our Institute take extra precaution to ensure crystal-clear understanding of confusing materials for its broad audience? This issue is not simply a matter of academic freedom, but that of social responsibility. Perdue wrote, “The American university is based on the fundamental principle of academic freedom. Scholars must be allowed to engage in whatever research activities they find most challenging in their professional fields,” and “no one can tell them what to study, or demand that their word be suppressed.” I totally agree. But Perdue’s letter twists (whether intentionally or not) the arguments behind our protests. No one said Dower cannot do his research or publish his work. The contents of “Visualizing Culture” had been available for several months to the students taking the course, and no one protested. It was only after these materials were publicized to everyone in the world that there were mass protests. We are protesting the careless way these materials were presented and publicized, because they can easily arouse psychological pain and distress to more than one billion people in the world. When OpenCourseWare makes all of its materials accessible to the world, it’s no long merely an academic tool, it has become a form of mass media, sponsored by one of the most prestigious educational institutions in the world. My first reaction after seeing Perdue’s open letter is shock and disbelief. I was shocked by the condescending and rude way it addressed Chinese students. But I further feel sorry for him, because after doing research on East Asia for more than “25 years” he still lacks the basic understanding of the psychology and culture of the study subjects and basic respect for them. I must claim what I write in no way represents the opinions of University of Texas at Dallas.